There is no doubt that the internet has made our lives easier. One of the most obvious ways is with communication. There are now multiple methods which allow users from around the world to connect at no extra cost. Instant messaging as we know it today has allowed people to chat in text form and in real time since the 90s. Remember AOL Instant Messenger, ICQ, and MSN Messenger? Where things have most advanced is with all of the added features and mobile app versions of what were once desktop programs and web based platforms. According to a new infographic from Skilled.co at the start of 2016 mobile messaging apps collectively had 1.4 billion users – a growth of 31.6% from the same time in 2015. 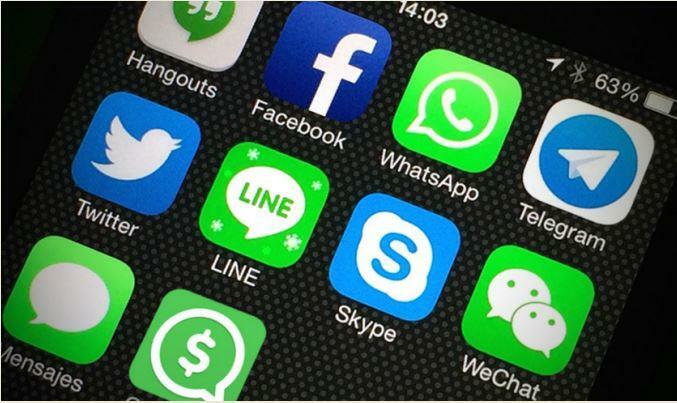 By 2018 a staggering 80% of all smartphone users are expected to be active on messaging apps! But where did it all begin? Believe it or not, the actual idea of instant messaging was brewing before the web itself (browsers and web pages) was invented. That’s right, in 1961 MIT’s computer Center developed a multi-user operating system known as the Compatible Time-Sharing System (CTSS), which allowed 30 of their computer users to log-in simultaneously and send each other messages. In the 80s came the Zephyr protocol that combined several UNIX programs into one complete messaging system that relied on a user’s IP. Its closest rival was the Internet Relay Chat system, where users could install a client and connect to chat-servers on a network. Both are still used in some form today. The masses were not exposed to instant chat until the ICQ desktop program was launched in 1996 and allowed one-on-one and multi-user chats, the transfer of files between users, and the ability to search registered users in a database. A similar platform was released by AOL in 1997 and MSN also enter the marketplace. Despite widespread appeal most of these platforms are now dead or integrated in to newer services. According to Skilled.co the current most popular messaging apps are WhatsApp, with a billion monthly active users, Facebook Messenger (with a similar sized user-base), China’s WeChat (818 million monthly users), Israel’s Viber (249 million), and Japan’s Line app (220 million). What they all have in common is that they’re mobile and serve many more functions beyond just messaging in real time. In fact Facebook Messenger, WeChat and Line all allow users to pay each other money within the app at no extra cost, using linked payment cards and other funding sources. WeChat can even facilitate the payment of household bills and the booking of transport like buses and taxis. Quite what the future holds for instant messaging and messaging apps is anyone’s guess, but in such a competitive marketplace and with advancing virtual and augmented reality technology – the next big leap forward might not be that far away. To learn more about the ‘5 biggest messenger apps’, their popularity across the world, unique features, and underlying technology – be sure to check out the full infographic from Skilled.co.